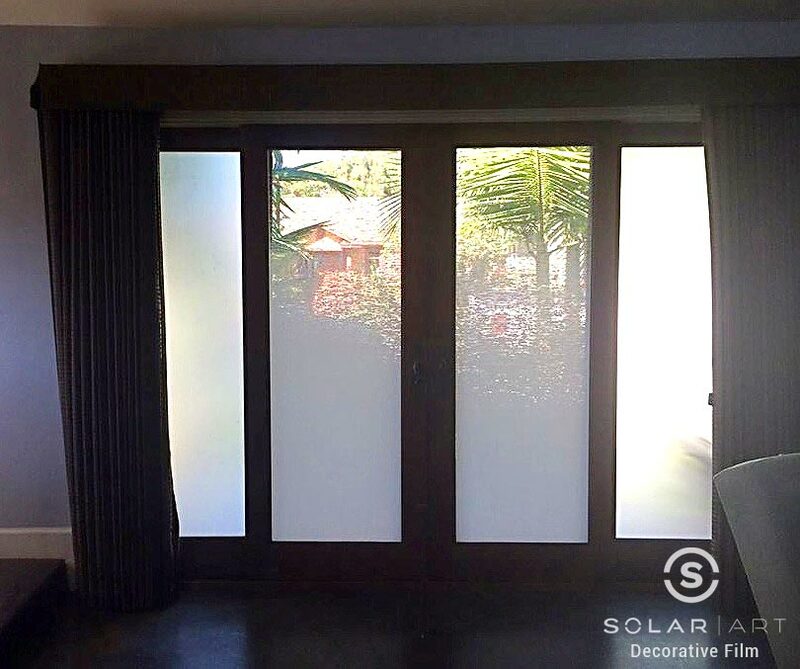 Solar Art installed gradient window film to a home in San Clemente, California! This customer had a Llumar gradient window film installed on the inside two panes and Llumar frosted window film on the outside two panes. The homeowner was having an issue with neighbors being able to see into their living room windows on the side of the house.They were looking for a way to create privacy from their neighbors in their living room while still allowing in some natural light to not darken their room.They had tried having blinds and shades installed but they created too much darkness in the room and the homeowners weren’t happy with them so they had window film installed. Gradient window film is an opaque window film at one end that gradually fades into having no opacity. Gradient window film can be installed with the opaque portion on the bottom or on the top of the glass pane, depending on what you are looking for. This particular customer installed the opaque portion of the gradient window film on the bottom of the window to create privacy and allow natural light to come through the top of the window. If you are looking for a custom gradient, Solar Art’s in house team can produce whatever you are looking for! A common reason customers will choose to have a custom gradient installed is so they can decide where the privacy and full height will start. Not only does gradient window film and frosted film create privacy, it also keeps a modern and classy look. It will reduce heat and reduce glare making the room more comfortable and enjoyable. Decorative window films is installed the same way as solar film, anti graffiti film and security window film. It will block 99% of UVA and UVB rays and is easily removable. Both frosted window film and gradient window film looks great in residential settings, but commercial buildings as well! They work great in private offices or conference rooms! If you are unsure of what you are looking for you can speak with one of our sales representatives or graphics specialists to get exactly what you are looking for! Interested in Gradient Window Film? Contact us directly to talk about Gradient Window Film! Gradient window film provides window privacy for your home or office and comes in a variety of frosted window films or you can even create a custom gradient. Contact Solar Art to learn more!